A crisp and fresh DOMESTIC Granny Smith, dipped in buttery caramel, then dunked in our creamy milk or dark chocolate- then rolled in crispy crushed OREO cookies! 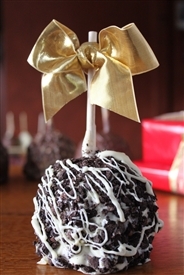 We can offer this to you for about a third of what the big "famous" caramel apple makers charge online! Why? Because we don't spend 20 million dollars on internet search advertising! We know a little more about chocolate, caramel and how to make a candy taste delicious because we have been doing it for 83 years! We only use fresh, genuine Oreo cookies and we do not buy them pre-crushed.